I recently acquired a new Dell XPS15 laptop, thanks to a very generous gift from Dell. It has a very nice screen, and much higher DPI than I’m used to. Icon labels on the Desktop were still unreadably small. The text in the address/search bar in Chrome was unreadably tiny. Webpages themselves ended up with bizarre CSS text problems, mostly a combination of text being huge, but the containing box still being tiny, so the text wouldn’t fit, and so you’d have weird overflow issues or text getting cut off. Various apps wouldn’t remember settings, and would reset to tiny unreadable fonts. Finally I figured it out, and it’s really simple. Fire up the Unity control center (yes, I use Unity. I’m used to it.) and select Displays to access the display settings. Screenshot of the Settings application. You want to select ‘Displays’. 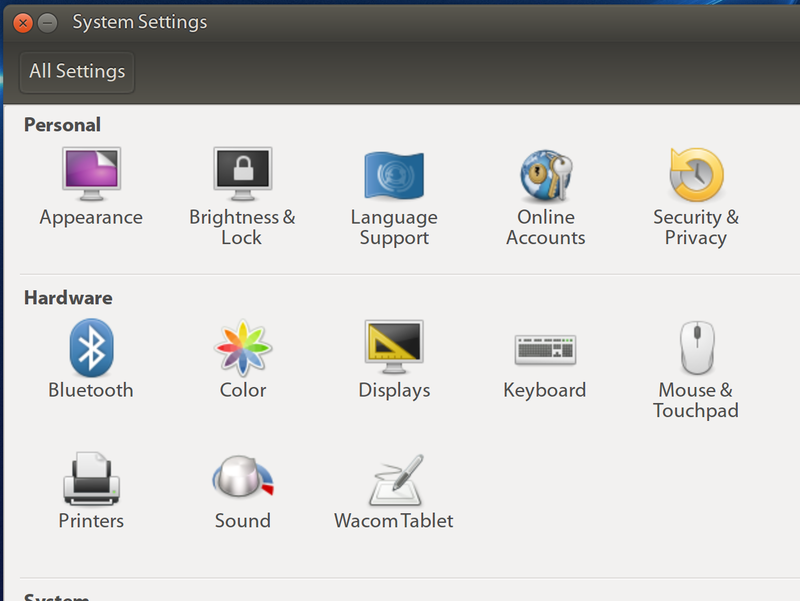 In the Displays settings, at the bottom left is an option for “Scale for menu and title bars”. This was set to 1, and I increased it to 2, which made everything look fine. 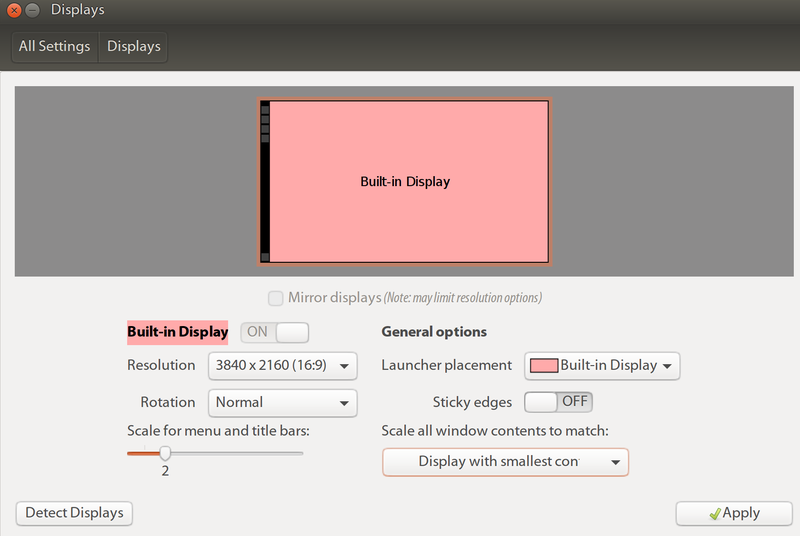 Displays settings for Ubuntu. Note the ‘Scale for menu and title bars:’ option. This scales everything to a readable size, and I could reset all my fonts back to something a little more sane (12 point instead of 32 point, for example). It fixes the address bar in Chrome, and the icon labels in Nautilus. Everything, basically. I hope this helps you. I looked high and low for this solution and couldn’t find much, and what I found wasn’t very helpful. If this does help you out, leave a comment or link to this blog so more people can find the solution. Tagged 16.04LTS, display, fix, font, screen, text, tiny, ubuntu. I have a similar problem to the one solved here. I changed the scaling to 2, and then tried the unity tweak tool. Didnt seem to make a difference. The icon text and font in nautilus all seem way too small. In Tweak Tool all my fonts are at 12pt, scaling factor of 1.00. The only difference I see on the Display settings is that I’ve got mine set to match the smallest display, not the largest. Since there’s only one, I don’t know that it’ll make a difference. The font and logo display on the desktop is controlled by Nautilus, so maybe look at your preferences there? There are controls for Icon and List view Zoom levels you can change, which might help. Mine are set to 100%. Good solution. Thanks for this.